A comprehensive guide to producing details that look handsewn with the ease of the machine. You can create beautiful, delicate effects with the help of clear, step-by-step instructions. Can be used by sewers of all skill levels for mastering classic finishing and embellishing techniques. Carol is a lifelong sewer and former fabric store owner and machine dealer. She's shown thousands of students worldwide how to teach their sewing machines new tricks! . She is known for her best-selling book Fine Machine Sewing and for her 20+ years of contributions to both Threads and Creative Needle Magazines. 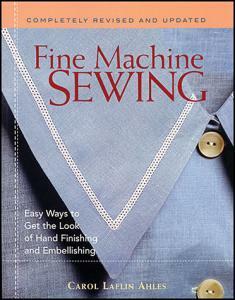 Fine Machine Sewing - Easy Ways to Get the Look of Hand Finishing and Embellishing, Carol L. Ahles, Taunton Press, updated 2003.Softcover, 208 pages. Same as the revised and expanded 2001 edition except in softcover and updated to include more new machines on the settings chart plus revised tips on transporting your machine.